Philadelphia, Pennsylvania – September 15, 2016 – Janney Montgomery Scott LLC (“Janney”), a leading full-service wealth management, financial services and investment banking firm headquartered in Philadelphia, PA today announced that Gregory Dupée, Senior Vice President/Wealth Management of the Karpiak-Dupée Investment Group; Mary Anne Forrester, Assistant Vice President/Wealth Management; and Allan Strange, Executive Vice President of The Strange Group, have been named to the 2016 Financial Times “Top 401 Retirement Advisors”. The Financial Times and Ignites Research, the FT’s sister company, contacted large US brokerages, independent advisers and other wealth managers to identify qualified applicants. Our partner, Broadridge Financial Solutions, provided data that helped identify advisers specializing in serving DC plans, including 401(k) pensions and other DC accounts. Applicants were required to advise at least $50m in DC plan assets and have at least 20 per cent of their client assets in DC plans. For the complete methodology behind the compilation of this list, visit www.ft.com. Greg began his career in 1986 working with an actuarial consulting firm specializing in Taft-Hartley pension administration. This led to a position on a team from Drexel-Burnham Lambert analyzing distressed securities, high-yield bonds, and corporate bankruptcy restructures. In 1989, Greg joined Prudential Bache & Co. to directly advise holders of distressed securities whom he had met through the Drexel connections. In 1995, Greg joined Wheat First Butcher Singer to build his own wealth management practice — remaining there through several mergers and successor firms, moved his practice to RBC Wealth Management in 2003, and joined Janney Montgomery Scott in 2015, along with Scott Karpiak. Greg attended Lehigh University, and earned his degree in finance from Temple University, where he also minored in business law. He holds the Series 7, Series 31, Series 61, and Series 65 licenses, as well as his Life Insurance Producers license. Greg is a current holder of the Accredited Investment Fiduciary, (AIF) designation from the Joseph M. Katz Graduate School of Business at the University of Pittsburgh, as well as a holder of the Accredited Wealth Manager (AWM) Designation, a program conducted by the Estates & Wealth Strategies Institute at Michigan State University. He also recently attended the Leadership Boot Camp for Investment Stewards, an intensive training program based on the LeaderMetrics® framework, sponsored by 3ethos and conducted in affiliation with The Thayer Leader Development Group at West Point. Mary Anne Forrester joined Janney in 2001 and brings with her a wealth of knowledge to her business by having over 25 years of experience in the retirement and financial services industry. She has an unwavering commitment to offering the highest quality of investment service and advice to her clients. Mary Anne, along with the support of Janney’s Wealth Management team, services 25 retirement plans while managing over $200 million in client assets. Mary Anne was named as one of the National Association of Plan Advisors “Top Women Advisors” in 2015. Mary Anne earned her Bachelor of Business Administration from Chatham College in Pittsburgh. She holds her Series 7, Series 63, Series 66, as well as Life and Health Licenses. Additionally, she has earned her Accredited Investment Fiduciaries (AIF) designation, and is a member of NAPA National Association of Plan Administrators. Allan Strange has been advising clients on their investments for over 32 years, and consistently has been ranked by Barron’s as a “Top Advisor,” previously being named in 2009, 2011, 2012, 2013, 2014, 2015 and 2016. 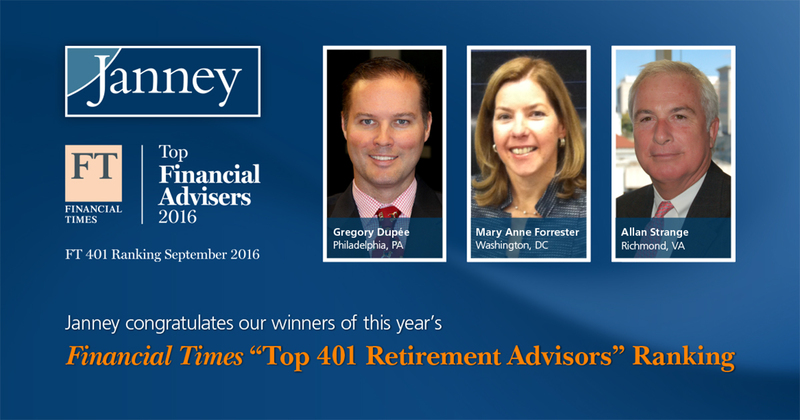 He was also named to the 2015 Financial Times Top 400 Advisors and Top 401 Retirement Advisors listings. He has been a member of Janney’s premier CEO Roundtable since joining the firm in 2009, and has earned the Accredited Investment Fiduciary® designation from Fiduciary 360. An avid golfer, Allan played professionally for 3 years after graduating from East Tennessee State University.